Today is my birthday! I can officially run for President of the United States. Here is a list of my qualifications, credentials, etc. Postnatal care in the UK: home visits! We were discharged from the hospital about 24 hours after the wee boy was born -- more than enough time in the birthing centre considering I had a natural birth and was feeling almost spritely. Baby's first car ride was in a classic black taxi cab, and we walked the pram down our cobblestone street holding hands and grinning, just like the end of the fairy tale. holding the sleeping boy. I'm pretty sure each of us read an entire novel that first night, seeing as reading was the only thing that could keep us awake. The next morning around 10am, there was a knock on our door. Emily, our midwife, returned for the first of many postpartum home visits. (She had visited our apartment previously when I was still pregnant.) We offered her tea, but she politely declined saying, "If I had a cup of tea at every home visit, I'd be up all night." Home visits are routine as part of the British maternity system. She made notes in the wee boy's health records, writing down such exciting factors as the color of his poo, how many wet nappies he had, and the temperature in our flat. Mostly, however, she was there to answer any questions we had and offer suggestions about caring for our newborn. We talked about everything from bathing to sleeping to taking him for a walk to help with the slight jaundice he had. We talked about how David and I were coping and discussed our own health -- both physical and mental. She checked to make sure I was healing properly, felt around to make sure my uterus was getting smaller. And we did all of this while still in our pajamas. Depending on how much help you need, the midwives are there to come every day for a couple of weeks. We were doing surprisingly well, so we said we didn't need daily visits. Emily returned a few days later to weigh the boy with a portable scale and take some blood samples to check for genetic disorders (the "heel prick test"), which, again, she did in the comfort of our living room. She came every other day or so until the boy was two weeks old, at which time, she discharged us. It was an amazing comfort to be so well-taken care of, especially during a time of uncertainty. Nothing can prepare you for parenthood, so it was really nice to have someone there who was emotionally uninvolved, yet completely caring. In the US, women can hire postpartum doulas to play a similar role (and if I ever have a baby over here, I will absolutely hire someone for this service). But I can't imagine having to go out in public so soon for doctor visits and such. Are there any pediatricians in America who make house calls to new babies? Since everyone is #RoyalBaby crazy this week, I thought I'd do my part to explain what I know about the British maternity system (To be clear, my dealings were with the Scottish NHS, which is a different body than the English NHS). First of all, while Americans were freaking out wondering why Kate was "overdue," the midwives over there were likely expecting it. They don't induce until two weeks past due date, unless there is some medical emergency. I, like Kate, was 41 weeks and 2 days. Catch up on my birth story part one, two, and three on previous blogs, and I'll begin with postnatal care here. The midwives placed my wee boy directly on my chest (standard policy) and watched to make sure he latched on properly. They did not cut the umbilical cord, nor did they wash the baby. What is known as "kangaroo care" in the hippie-birthing community in the US seems to be standard procedure in Scotland. The "Ready, Steady Baby" book that the NHS gives out to all pregnant women goes into great detail about the importance of skin-to-skin contact in the first few hours of baby's life. Sometimes that skin-to-skin needs to be with the father, and in our boy's case, he got more time with David than with me. I nursed him for a while, but I was bleeding a bit more than the midwives liked. "Gingers are bleeders," I was warned, but I'd still wanted to avoid the shot of oxytocin that is often standard in American births (and I'd said as much in my birth plan). The boy was nursing well, but my uterus wasn't contracting quickly enough to stop the bleeding. Minor postpartum hemorrhage is a loss of over 500ml, and I had already bled over 700ml. When they asked if they could give me the shot. I agreed, having seen fear in David's eyes. I guess it worked because the placenta was delivered pretty much immediately. After about thirty minutes, David cut the cord and settled down in a bean bag to cuddle with the baby while I got, um, a few stitches. And that's all that I'll talk about because that's a bit more personal than I intended. When the midwife was finished quilting my nether-regions, she left us alone with a fresh platter of, get this, tea and toast. How British is that? To be completely honest, this may have been the best meal of my life. It was thick white bread, toasted perfectly and slathered with butter -- strawberry preserves on the side. The tea was piping hot, and I doctored it with "milk and one," as they say (milk and one sugar), to make a tasty, sweet, albeit caloric treat. Birth is supposedly uses more energy than running a marathon, so I needed every last calorie. After inhaling my tea and toast, I took a shower (in my HUGE private bathroom) and a much-needed nap. Here's something else that Americans might consider bizarre: the baby never left our room. It's called "rooming in," and is recommended by most maternity units in the UK to help with bonding and to prevent infection (hospitals are germy places, after all). In fact, after a few hours, David and I wondered if they'd forgotten about us, as we were left in peace with our newborn. The minimum time I'd need to stay in the birthing centre was six hours, and the boy was born at noon. By 6pm, I was hoping to be able to either stay in the large private room (it had a sofabed for David and a television to watch the premier of Season Three of Downton Abbey), or maybe even be discharged. Instead, the midwives returned to take our dinner orders -- there was an actual menu, with plenty of vegetarian options -- and ask if I'd stay the night. The NHS likes to keep new mothers overnight (even those with uncomplicated births) in order to help with breastfeeding and offer guidance on newborn care like bathing and diaper changes. Because I'd lost a lot of blood, they also wanted to check the wee boy's platelets in the morning. The downside to my staying overnight was that David would have to go home. Unlike Prince William, we weren't paying for private care, ergo we hadn't rented an entire wing of the hospital. I'd be staying in a four-bed ward, which was actually much roomier than it sounds. I was hesitant, but it was a huge room divided with curtains into four separate bed areas. Each area looked just like a hospital room you can imagine in the US -- chairs for visitors, a hospital bed, and some machines -- and felt very private, except that you could very much hear the other new mums and babies. There was a cradle on wheels for the baby that was an arm's reach from the bed, allowing everyone to get some rest. David and I ate our dinner in the large dining table in the center of the ward, while the boy slept in his cradle a few feet away. Then David kissed me goodbye and took a taxi home. I collapsed in the bed and tried to get some rest. Even though I should have been completely exhausted, I could barely sleep. The bed was plenty comfortable, but I was running on endorphins and a hormone high that wouldn't crash for four more days. I slept about 45-60 minutes at a time every few hours, waking whenever my baby stirred. A midwife came to check on me and the baby at least once an hour. When I was awake, the midwife would sit with me to make sure feeding was going well (another new mum who was having trouble with breastfeeding was allowed to stay in the ward for several days until she got the hang of it) and that the boy had enough wet and dirty diapers. The midwives even guided me through my first diaper change. It was very hands-on, and I very much appreciated the support. Around 7am, a huge tray of tea and toast arrived on the dining table, and each of we four new mums emerged ravenous. We laughed and spoke about our births and our babies -- mine was the only one who didn't yet have a name. We helped ourselves to cereals, oatmeal, fruits, and yoghurt (a very continental breakfast), while we waited for the pediatrician to come by and examine our babes. David came back by 7:30 -- before visiting hours officially began, but no one said a word about it -- and cuddled up with the boy and a book. The pediatrician came by and checked each baby in the ward, followed by an ear specialist who conducted a hearing test. Midwives delivered multiple packets of information on everything from SIDS (called "cot death" in the UK) to swaddling to breastfeeding and signs that the baby is hungry to how many wet & dirty diapers to look out for and various other details on how to care for a newborn. We were discharged around noon, after checking the boy's platelets, just about 24 hours after the birth. We couldn't wait to get back home to our teeny tiny flat on our cobblestone street. If you want to read from the beginning of the Having a Baby Abroad series of my blog, begin here. Tomorrow on the blog: They send midwives to your home?!?! Follow this blog on Bloglovin'. Royal Baby Fever! Haters are silly. There are a lot of #RoyalBaby haters out there making noise today. If it's for political reasons, I totally get it. Monarchies are weird, and, as an American, I will never understand them. But then again, nowadays the monarchy isn't much different than Bill Gates or any American who is due to inherit a large corporation or a lot of real estate (and honestly, these people probably have a lot more political power than Queen Elizabeth has ever had). But a lot of the haters seem to be the same people who complain that the only thing that's ever on the news is awful stuff. Maybe I'm just scarred from my time working in hard news (I took in a live feed from Columbine and have images I will never be able to get out of my head), but it's really nice to see something happy and exciting and with a sense of history getting coverage. I'm teaching a lot of lessons today, so I won't be able to sit in front of the computer and watch the live feed of the hospital door where Kate & Will are expected to emerge. But I will have the laptop open and my Tweetdeck or something like that set for alerts. I'd also like to point out that Kate is 9 days "overdue" -- just like I was. And just like the average first-time mom who goes into labour naturally. Can we make a motion to just change due dates to 41 weeks instead of 40 weeks already? This week on the blog, I plan on detailing my post-natal care with the British maternity system, in hopes of explaining what kind of care Kate is probably receiving. Did you read in the tabloids that the swanky private hotel room in which Kate is supposed to deliver costs a shocking £1000 a night?! That's shocking to the British because it's £1000 ($1500) a night more than most women over there expect to pay for a hospital stay (I didn't pay a cent for the birth of my wee boy). And it's shocking to American women because it would be cheaper to buy a first class plane ticket to London, have a baby in the exact same hospital suite, and pay out of pocket for all that of that, than it would to have a baby in an American hospital. In fact, if I ever have another baby, I think I'll do just that. Fly first class, rent a flat in London for a month, deliver at St. Mary's Hospital in Kate's swanky birthing suite. It's a lot more fun to spend money on that than writing checks to a US hospital. $1500 for a decent apartment in London. Maybe 2 nights in the hospital (though I only spent one there last time because I was fine, and I wanted to go home). So $3000 -- maybe half that if it's another natural birth, and all's well. Yeah, that's $4100-$5600 total to travel economy class, pay rent $5900-$7400 to travel first class. in London for a month, and have a baby. Even if the newspapers' estimates of Kate staying for a few days and paying upwards of $15,000, that's still cheaper than it would cost on my current insurance plan. So tell me: how much did YOUR birth cost? I stayed at home for about four hours with severe back labour (baby was posterior) and inconsistent contractions before our doula drove us through the cobblestone streets to the Birthing Centre at the Edinburgh Royal Infirmary. There, the midwives checked my vitals and took blood to check my platelets at triage and finally allowed me in one of the swanky birthing centre rooms. I got in the birthing pool at about 6 centimeters and my water broke in the tub about 5am. Also, I write "labour" instead of "labor" not because I'm a pretentious ex-ex-pat, but because it was hard work, so I believe it deserves as many letters as possible. That, and I read enough British books about childbirth that leaving the "u" out just looks wrong. I'll tell you that I absolutely loved the maternity system that the NHS offered. That said, the one thing I was hesitant about was that you generally don't get to meet the midwife who will deliver your baby unless you are having a home-birth (not uncommon). You are supposed see the same midwife throughout your pregnancy, but because our original midwife was promoted, then our second midwife went on maternity leave, we ended up seeing three different midwives. ** When I was about six months pregnant, I started to get frustrated and worried. I knew I could handle birth, but I wanted to make sure I would know someone in the delivery room. So we hired a doula. Birth story fanatics probably know what a doula is, but for you who don't, it's basically a woman who assists in pregnancy, childbirth, and/or postpartum days to act as support for the mother. Nicola was fabulous. Most of the birth, she sat on a nearby couch and calmly knit a teeny baby hat for the wee boy. It was the perfect activity -- kept her busy, but mostly kept David calm. Whenever he suspected something might be wrong, or whenever he heard me make a weird animal noise, he could just look over at Nicola and she wouldn't have flinched. She'd seen hundreds of births, so she was very reassuring to my husband. I loved being in the pool, mostly because it gave me an immediate way to tune everyone out. Despite this very public blog and my very public career, I don't actually like a lot of attention (unless I'm on stage). Being in the tub was great because I could just go underwater, float, or at least just put my ears under and not listen to anything anyone was saying. Most of the time, I tried to float calmly, but as my back would surge, I did make a few sounds. And I said a few words. And it turns out I have a bit of a potty mouth when it comes to childbirth. Weird for a piano teacher, but then again, I'm also a publican's daughter. At one point I'm pretty sure I yelled "HYPNOBIRTHING IS A CROCK OF S***!!!!" (Oddly, I still use the Hypnobirthing App to fall asleep at night. It's very soothing.) I guess I was pretty vocal because the midwife did offer me some gas & air (half oxygen and half nitrous oxide), which I tried for a short while, but didn't seem to make much difference in my pain level. It did help me concentrate on my breathing, but I soon found out that blowing bubbles in the water was equally helpful and much easier. David's favorite story to tell is about the shift change. At 8am, Gillian the midwife came in to announce she was turning things over to Julie. Both women were in their early-to-mid-twenties, but Gillian seemed a bit more confident. She went over my charts with Julie and attempted an introduction while I was floating around, eyes closed, ears underwater. Allegedly, just as Gillian said, "Julie, this is Brigid," I came up above the water and shouted "MOTHERF*****!" and immediately went back underwater for a long time. I think David was embarrassed. Nicola laughed. Gillian and Julie held it together like professionals. Julie turned out to be every bit as confident and good as Gillian, despite looking like a deer in headlights at first. She recorded my contractions in my maternity notes, and she let me push without coaching, as my birth plan had requested. I started pushing shortly after shift change, but I wasn't actually sure if I should be pushing or not. I felt the urge, but I'd read that posterior babies often make you feel the urge long before it's actually time (again -- too much reading). The midwife checked me, as I was starting to "have a bit of a show," and she agreed that it was definitely time to push. And I pushed. And pushed. I was able to feel the baby's head (he had a lot of hair), but somehow he wasn't coming out. After each push, the midwife used a handheld monitor to check the baby's heartbeat, which she then recorded in my maternity notes. After about 2 hours of pushing, the midwife asked if would perhaps like to get out of the tub and try some different positions. I was sad about giving up on the water birth, but I was started to get tired and wanted this baby out. So I climbed out of the tub and made good use of all the bean bags, pillows, mattresses, and chairs in the birthing room. I threw my arms around David's neck and lunged forward. I could feel the baby crowning, but couldn't quite get him out. The midwife would chase me around with a monitor after each push, but all I wanted to do was walk around, which made monitoring the heartbeat difficult. I was getting tired, and I needed a break. Somehow I was actually able to fight the contractions and hold back the pushes, which started to concern the midwives, thinking perhaps my labour was stalling. I told them it wasn't, I was just breathing through the contractions and not pushing as hard as they wanted. They then asked if they could do some aromatherapy, which I agreed to. Well, whatever oils they opened up had an immediate effect. I mean, it was bizarre. One breath and I was contracting every thirty seconds or something -- back to full-on pushing. Newborn baby. Where'd he get that dark hair? I'll wrap it up here and say that I ended up pushing for about four hours total. The wee boy was not born in the water, as planned, but that's because he was a stubborn boy who insisted on coming out with his hand over his face (a nuchal hand, as they say, and don't click this link to this random blog, unless you want to see a very graphic image of a baby being born). David had originally intended on catching the baby, but he ended up wanting to hold my hands while I pushed (sweet, no?). The wee boy was born at 12:04pm. He weighed 8lbs8oz, was 22" long, and had a HUGE head that was shaped like a rugby ball. It wasn't the full-on water birth that I'd planned, but he was born with minimal intervention and was delivered by midwives. I'm pretty proud to have managed twelve hours of back labour. I feel like if I were to ever actually have a proper-facing baby, it would be a piece of cake. Next blog ... I'll talk about postnatal care because I think that's crazy-important. **To be fair, I did see the same midwife for the last several months of my pregnancy, and if I'd had a home birth, she would have delivered the baby. She was great, so I blame my initial worry on hormones. I see a direct correlation between the amount of blogs I write and the amount of anxiety I feel. There haven't been any scientific studies to determine causation, but I suspect it's the lack of writing that makes me feel crazy. Should be an easy fix, no? My birth story isn't finished, mostly because every time I sit down to write it, I start thinking about all the things about the British maternity system that I want to write about. I think about all the things about the American maternity system that upset me, and then I just get angry and slam the computer shut. I've also been completely obsessing over the Royal Baby. David would tell you that my most common inquiry is, "Do you think Kate's having her baby now? ... What about now?" I've never cared at all about any celebrity pregnancy, but this one is exciting. I mean, someday students will have to memorize this child's name. 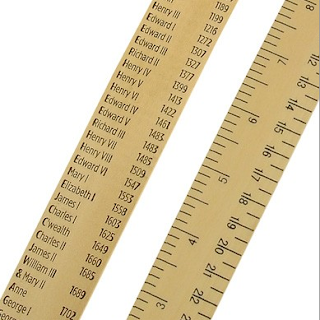 It'll appear on a ruler in gift shops! On currency! It'll get to carry a sceptre and a crown. I am a nerd about history, and this is pretty cool. 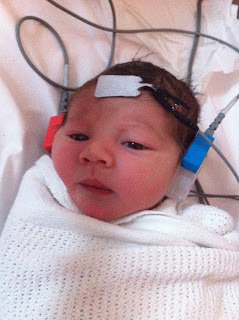 Anyway, sorry for yet another blog post that isn't the final chapter of my birth story. I just needed to write something and feel connected to y'all. So ... do you think Kate's having her baby now? Birth story replaced by rants and observations. Rats! I had the birth story part three all written and typed. I wrote it, like, a week ago, but hadn't posted it yet. And now it appears that my computer has eaten it. Rats! Instead, I'll make an observation. Yesterday, D had a doctor's appointment at 1:00. He didn't actually see the doctor until well past 2:00. The longest we were made to wait for an appointment in Scotland under the evil communist health care system (and wow, did we have a LOT of appointments in that 16-month-period) was about 15 minutes -- and that was ONCE, for a sick visit we scheduled on the same day. More often than not, the doctors or midwives actually called us back a few minutes early. If they were even one minute past the scheduled time, they apologized profusely. I know it's not the fault of American doctors, but it is TOTALLY ANNOYING BECAUSE IT HAPPENS EVERY SINGLE TIME!! redhead who's had severe atypias and other precancerous moles before) was AUGUST 23. I asked to be on the cancellation list, and they were eventually able to fit me in on July 17, so at least I've got that going for me. Anyway, don't talk to me about waiting lists. I should have just flown back to Scotland to get this mole looked at. It would have been cheaper, and I would have gotten it removed faster and sooner. And I would have gotten to go to the castle. I know, I know, I should just move back and quit complaining ... can someone work on our visas, please?